Since the day they were first mined, the Endowment’s wallets have been public on the BTG blockchain, but rumors and misinformation persist. This post explains the Endowment mining process in detail and lists all of the wallets. In 2017, the Bitcoin Gold project duplicated (forked) the Bitcoin blockchain as a fair way to distribute 16 million coins, and then launched with an 8000-block mining period to create a 100,000 BTG Endowment to support the future of the project. As of early August, 2018, about 20,000 BTG have been spent from the Endowment and about 80,000 BTG remain. 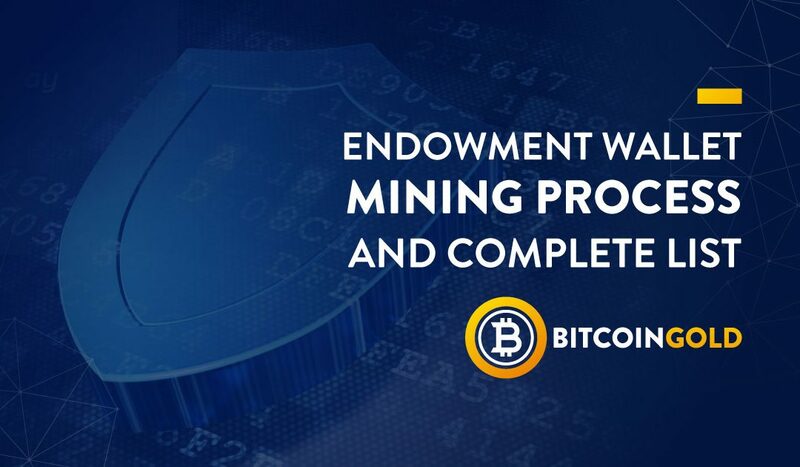 This Endowment is currently the only source of funding for the Bitcoin Gold project; after the formation of the Endowment on the day of launch, 100% of all mining rewards and fees have gone directly to the miners – exactly as described in our original Bitcoin Gold Whitepaper / Roadmap. and detailed in our earlier Endowment post. The funds we’ve spent from the Endowment align as described in the Roadmap – salaries and payments for infrastructure, developers, support staff, travel to promotional events… we have not spent any funds paying Exchanges to list BTG. Our developers are currently focused on bringing Lightning Network fully to life on BTG, and are working on Atomic Swaps, Smart Contracts, and more! The whole team is working hard to be Good Stewards of the Endowment so that it can support this project for months and years to come, despite the temporary bear market in cryptos. Note that there is no “new information” in this post– it is a summary of information that has been publicly available since launch in 2017, either in the public open-source code on GitHub, or on the BTG blockchain itself. This new ledger of BTG had the same number of coins in it – 16.5 million – each of which was in the control of the same owner as the original Bitcoin (because those people hold the private keys). On November 12th at 08:34:01, the BTG network was launched and mining began with BTG block 491407, the first block mined as BTG, on 2017-11-12 12:34:01 UTC. There was no mining and no coins were created between 2017-10-24 and 2017-11-12. The mining reward from the first 8,000 BTG blocks formed the Endowment. At a block reward of 12.5 BTG per block, 8000 blocks yields 100,000 BTG, as specified in the original Bitcoin Gold Whitepaper / Roadmap. If you’re good with code, you can confirm what’s written above by looking at the open-source code in our GitHub: 60% of the funds being time-locked for up to three years can be seen here. Enforcement of the official multisig wallet list is in the consensus rules seen here. If you’re not good with code, you can read still understand full mining process below, along with a full list of all the Endowment wallets. We include links to the blockchain explorer to make it easy to confirm on-chain. … and so on for 3200 blocks. At 800 blocks per wallet, these wallets accumulated 800 * 12.5 = 10,000 BTG each. The wallet addresses are listed below, and are also visible when looking at those block numbers in any BTG blockchain explorer. Each segment was mined round-robin into four wallet addresses, much like the earlier blocks. During the first 132 blocks of the segment, each address received 33 block rewards of 12.5 BTG, so each received 412.5 BTG. Then, for the 133rd block, the first address received an additional 12.5, bringing the total to 425 BTG in the first wallet. The total BTG for the segment is 425 + 412.5 + 412.5 + 412.5 = 1,662.5 BTG. After these 133 blocks were done, mining advanced to the next segment, which did the same procedure into four new wallet addresses which were time-locked for an additional month. Again, all the addresses in question are 4/6 multi-sig and require four signatures to withdraw funds, in addition to the time locks. As of early August, 2018, about 20,000 BTG from the 100,000 BTG Endowment have been spent, and 80,000 BTG remain in the originally mined wallets. Nearly 60% of the current funds remain time-locked. The complete list of Endowment mining blocks and their wallets follows below, broken into segments as described above. The first column shows the first block mined for each wallet; the second shows for how many months that wallet was locked. Links go directly to the noted wallet address or block in the official BTG explorer, but these can be verified in any BTG block explorer or full node.